Brace comb connecting the top bars between frames. (Oct. 12, 2015.) Pull one frame and all three of them want to go because they’re cemented together. Or they’re connected to the frames in the bottom box. Fun! I’m all for leaving the bees alone as much as possible. 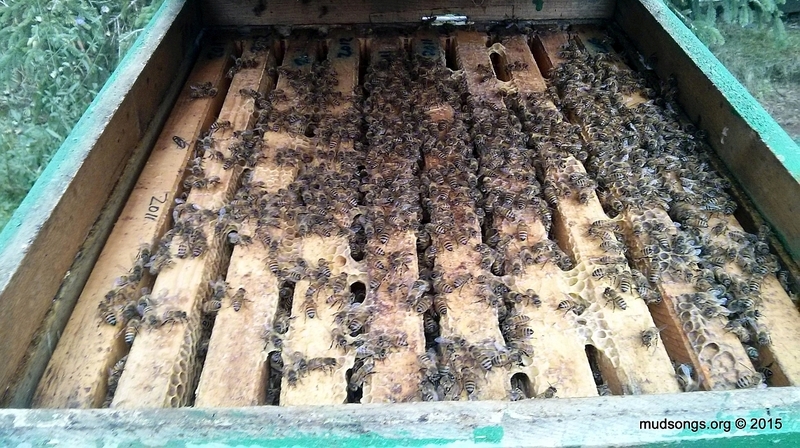 Most problems in the beehive are caused by the beekeeper poking around and messing with the bees when they shouldn’t. Learning to read the bees by paying attention to them instead of tearing the hive apart seems like a noble goal, a practical one too. But I still think it’s more important to see what’s going on inside the hive first, to observe what the bees are doing and when they’re doing it, and then move onto the more hands-off beekeeping. If I hadn’t known what was happening inside my beehives during my first and second summers — by looking inside the hives — all my external observations would have been mostly guesswork and it would have taken me forever to learn anything (especially in a place like Newfoundland where most beekeepers have to go it alone). Watching the bees build comb and make honey and raise baby bees was the most crucial aspect of my education as a beekeeper. And I couldn’t have done it without pulling out frames at least every two weeks during my first spring and summer of beekeeping. Postscript: After five years of good and bad beekeeping, most of my colonies are so well established that I rarely need to perform full hive inspections. My routine now is to reverse the brood boxes — basically move the brood nest to the bottom box — on a warm day in April. I clean up and inspect every frame while I’m at it and make any necessary rearrangement of the frames so the colony can grow and flourish as the spring kicks into high gear. If the queen is healthy, I won’t need to touch the bottom box for the rest of the year. I don’t do much with the second or third box either. I pull honey frames to give the queen room to lay and then I pull the occasional frame of brood to see how well she’s laying (and to check for swarm cells). I clean up the frames as well as I can whenever I pull any of them, but by the time June rolls around and the hives are exploding with bees, I’m basically done. Most of what I need to know I can tell by watching the bees outside the hive — and I can take a good guess from past experience what’s happening inside the hive. I’ll still check for swarm cells and make room for the queen to lay, but full inspections only happen when something goes wrong. It took me three years to adopt this relatively hands-off approach to beekeeping. Before my third summer, though, I was digging into my hives all the time. I was careful to put every frame back the way I found it, to move slow and gently with the bees, to use mist instead of smoke whenever possible, in general to minimize disruptions to the bees, but yeah, I was pulling out frames at least every other week. I’ve never learned as much as I did then, or had as much fun. 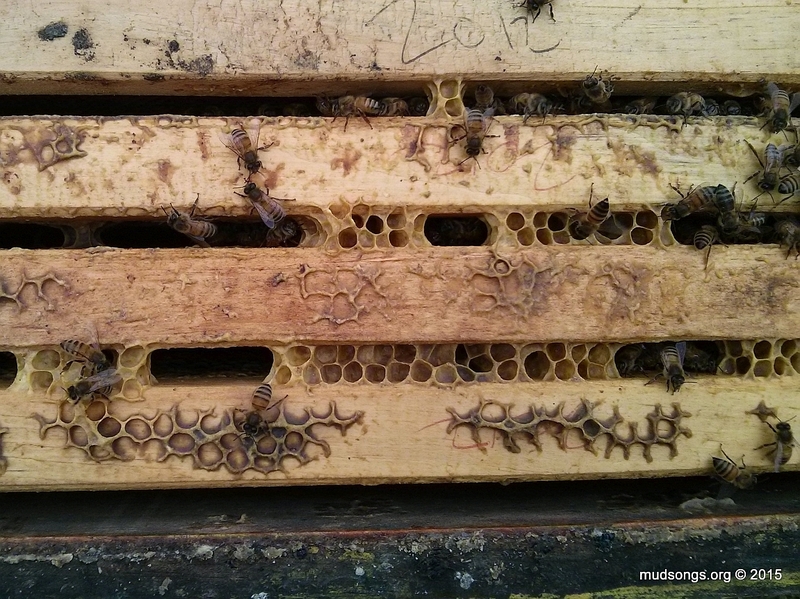 This entry was posted in Brood Nest / Cluster, Burr / Cross Comb, Comb, Drone Brood, Inspections, Nucs, Queens, Reversing Hives, Smoke, Spray Mist, Swarm Prevention, Year 2015. Bookmark the permalink. Good advice about getting in there to find out what is going on. Wishful thinking doesn’t work. Early on I was into them all the time as well, it’s how you learn. Simply providing them with a home while admirable, is fraught with problems, if you don’t take care of your charges. Agreed. I’ve seen some new beekeepers over the past few years who haven’t done well with their bees, and although bad luck can play a part in anyone’s misfortunes, it’s usually because they didn’t pay much attention to their bees. At the end of the day, everyone does whatever they have time for and whatever fits within their comfort level, but I think getting in there at least once every two weeks to see what’s going on is the best way to learn. It worked for me anyway. On a personal note, Perry, Wolfville must be a great place to keep bees. I’m originally from Nova Scotia and I miss it every day. Nice post. And if you want to prevent swarms, for example if you live in an urban area with neighbours who don’t like bees in their chimney, frequent inspections are a good idea even for experienced beekeepers.